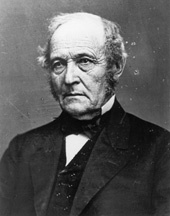 COLLAMER, Jacob, a Representative and a Senator from Vermont; born in Troy, N.Y., January 8, 1791; moved with his father to Burlington, Vt.; attended the common schools, and graduated from the University of Vermont at Burlington in 1810; served in the War of 1812; studied law; admitted to the bar in 1813 and practiced in Woodstock, Vt., from 1813 to 1833; member, State house of representatives 1821, 1822, 1827, 1828; State's attorney for Windsor County 1822-1824; judge of the superior court 1833-1842; elected as a Whig to the Twenty-eighth, Twenty-ninth, and Thirtieth Congresses (March 4, 1843-March 3, 1849); chairman, Committee on Manufactures (Twenty-eighth Congress), Committee on Public Lands (Thirtieth Congress); appointed Postmaster General by President Zachary Taylor 1849-1850; again judge of the superior court of Vermont 1850-1854; elected in 1855 as a Republican to the United States Senate; reelected in 1861 and served from March 4, 1855, until his death in Woodstock, Windsor County, Vt., November 9, 1865; chairman, Committee on Engrossed Bills (Thirty-fourth Congress), Committee on Post Office and Post Roads (Thirty-seventh through Thirty-ninth Congresses), Committee on Library (Thirty-eighth and Thirty-ninth Congresses); interment in River Street Cemetery. Papers: 1 letter (undated) in Seymour autograph collection, 1750-1945. Papers: May 12, 1849. 1 letter. Papers: Correspondence in Mary Edwards Walker papers, 1799-1919 (bulk 1860-1919). Papers: 3 letters by and 12 to Collamer (1849-1864) in various collections. Finding aid. Papers: 9 items and photographs. Papers: 1813-1903. 2 inches. Business and congressional correspondence and papers, including a letter (1865) to Justin Morrill about Lincoln's death and correspondence relating to statues of Ethan Allen and Collamer in Statuary Hall of the U.S. Capitol. Finding aid. Mower, Edmund C. "Jacob Collamer." Vermonters: A Book of Biographies. Brattleboro: Stephen Daye Press, 1931, pp. 48-52. U.S. Congress. Addresses on the Death of Hon. Jacob Collamer. 39th Cong., 1st sess., 1865-1866. Washington: Government Printing Office, 1866.